Typically, servo motors are a combination of four things: a conventional DC motor, a set of gearings, a potentiometer, and a control circuit. Among these four things, the potentiometer acts as a position sensor. As a result, servo motors can be controlled very precisely. In particular, a command can be sent to the servo so that the servo’s shaft rotates to a specific position. However, the disadvantage of these servos is that the rotation range is limited (e.g. between 0 and 180 degrees). Nonetheless, servo motors are very useful if a projects requires a motor with a precise control and awareness of its current position. The SG90 micro servo motor. In the background is a rotary angle sensor module and a potentiometer. Both can be used to control the servo motor. The SG90 is such a servo motor that can rotate approximately 180°. Moreover, is is very small and lightweight (Weight: 9g; Dimension: 22.2 x 11.8 x 31 mm). In this tutorial, it is shown how to control the SG90 servo motor. In order to control the motor, a so-called rotary angle sensor module is used. This module is nothing more than a conventional potentiometer combined with a knob. Therefore, it can be simply replaced by almost any potentiometer, since it is used here only for convenience reasons. 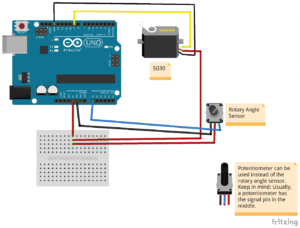 A scheme that shows how to wire the micro servo motor SG90 to an Arduino Uno. In order to control the SG90, a rotary angle sensor is used. 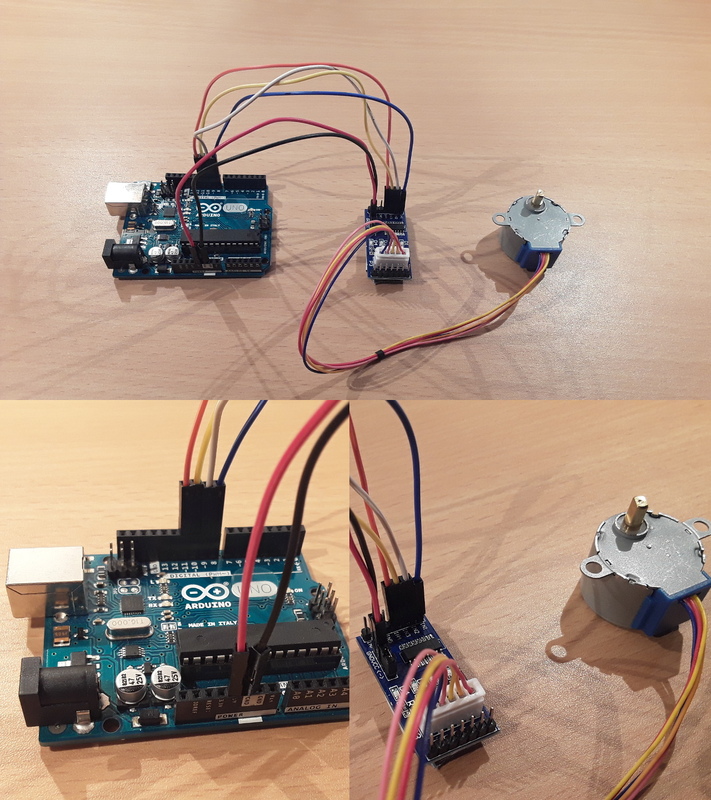 First, we connect the SG90 servo motor to the Arduino Uno. Both, the servo and the rotary angle sensor need a voltage supply. Since the Arduino Uno has only one 5V pin, we use a breadboard to split the 5V signal. The Arduino’s 5V pin is connected to a breadboard. Then, the servo’s red wire is connected to the breadboard (same column as previous pin). Next, the brown wire of the SG90 must be connected to one of the Arduino’s GND pins. In order to control the SG90 servo, PWM signals (Pulse Width Modulation) must be sent through the yellow wire. 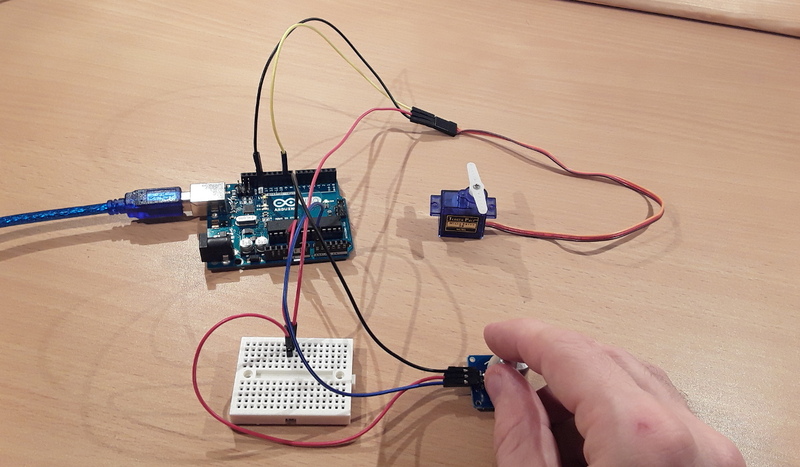 In this tutorial, digital pin 9 of the Arduino is used for this task and, therefore, wired to the SG90’s yellow pin. Following, we have to wire the rotary angle sensor to the Arduino. The sensor’s left pin is the ground which must be connected to one of the Arduino’s GND pins. The pin in the middle is the VCC pin, which must be connected to breadboard (same column as the other two pins). 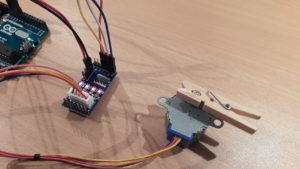 Finally, the sensor’s SIG pin must be connected to one of the Arduino’s analog input pins. Here, I make use of analog pin A0. If a potentiometer is used instead of the rotary angle sensor: Typically, the outer pins of the potentiometer must be connected to the power supply (GND and 5V pin of the Arduino). The pin in the middle is the signal pin which corresponds to the sensor’s SIG pin and must be connected to an analog input pin (e.g. A0). Luckily, the Arduino IDE has already a built-in servo library. In order to use this library, we have to include its header file. Next, we define two pins: digital pin 9 for the servo motor and analog pin A0 for the rotary angle sensor (or potentiometer). Then, a servo object is created that will be used to control the servo motor. Subsequently, two variables are defined. The first one is used to store the values retrieved from the sensor/potentiometer. The second variable is the rotation value that will be sent to the servo motor. In the setup function, we attach digital pin number 9 to the servo object. The servo object is now fully initialized and ready to control the servo. In the loop function, we read the analog value of the rotary angle sensor’s knob (or value of the potentiometer). As the Arduino’s analog-to-digital converter will map the voltage to values between 0 and 1023, we have to remap these values to an rotary angle value that is supported by our servo motor. Since the SG90 supports approximately 180°, we map the value two values between 5° and 175°. According to my experience, the SG90 does not sound very “healthy”, if the full range of 180° is used. Therefore, we subtracted 10° in order to avoid damaging our servo motor. After calling the map-function, the resulting value is used to let the servo turn its shaft. At the end of the loop function, we add a delay of 20ms to give the servo some time to turn its shaft. value_knob = analogRead(PIN_KNOB); // reads value of the knob/potentiometer. Return value will be between 0 and 1023.
servo.write(value_servo); // shaft of servo will start to rotate. value_servo is interpreted as an absolute position. 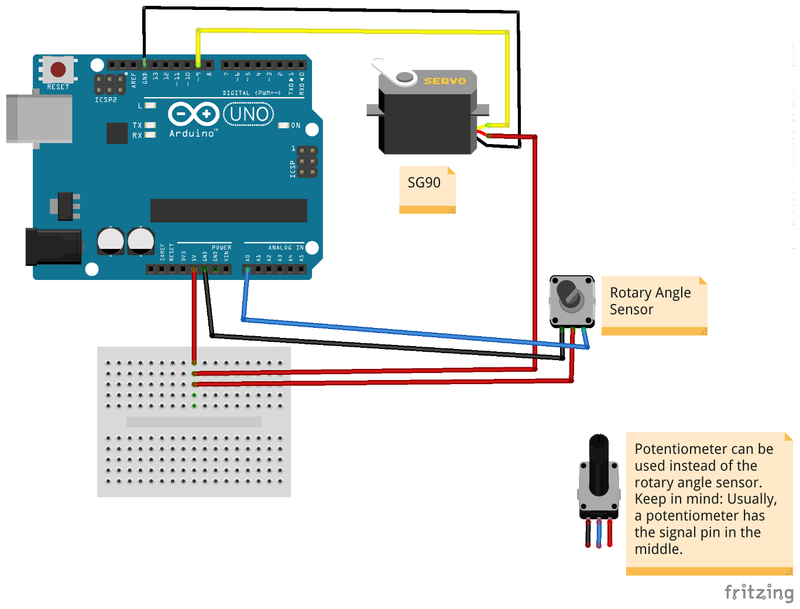 After transferring the program to the Arduino Uno, you should be able to rotate the servo’s shaft. 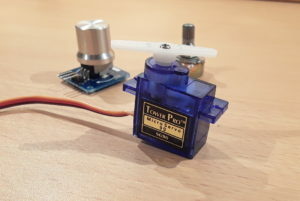 A SG90 servo motor that can be controlled by the knob of a rotary angle sensor. This entry was posted in Development on September 25, 2017 by mschoeffler. A 28BYJ-48 stepper motor connected to a ULN2003A driver board. A stepper motor divides a full rotation in multiple steps. As a result, a stepper motor can be driven much more precisely than a conventional dc motor. In particular, stepper motors are driven step by step. After having a quick look into the data sheet of a stepper, we know exactly how many degrees correspond to a single step of our motor. With this information, we can precisely turn the rotor of our stepper motor, since we then know how many degrees correspond to a single step. 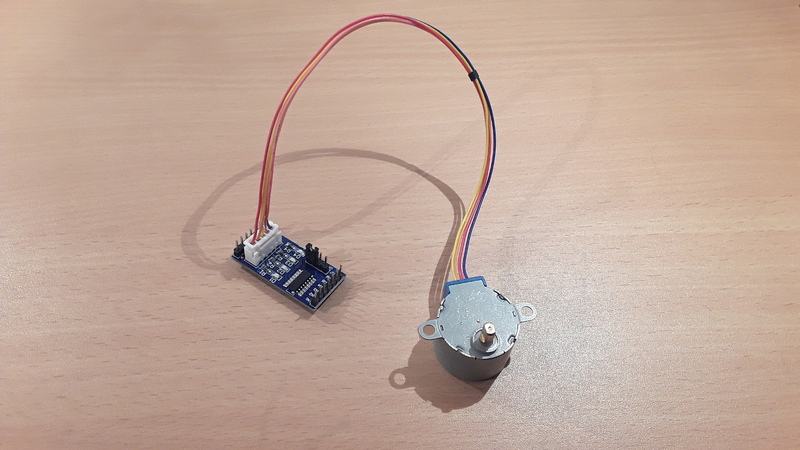 The 28BYJ-48 is a very cheap stepper motor that often comes with a ULN2003A driver board. Luckily, the Arduino platform has already a built-in stepper library that allows us to control the 28BYJ-48 stepper motor with the ULN2003A driver board. In this tutorial, it is shown how to control the 28BYJ-48 with an Arduino Uno. Pin layout that shows how to connect a 28BYJ-48 stepper motor to a ULN2003A driver board and an Arduino Uno. Typically, the 28BYJ-48 motor comes with a 5-pin connector that fits to driver board’s connector. The driver board has two pins for the power supply which are labeled GND and VCC. The board’s GND pin must be wired to the Arduino’s GND pin. Accordingly, the board’s VCC pin must be connected to the Arduino’s 5V pin. Important remark: With this setup, we are powering the motor directly from the Arduino. The advantage is that this is the possible easiest solution for providing power to the motor. However, if the motor consumes too much power, the Arduino can be permanently damaged. If you use a different setup (driver, motor, source code, etc. ), make sure that you do not draw more than about 300mA out of the Arduino. If you need more power, just use an external voltage supply for your driver board. Lastly, the driver board’s IN1, IN2, IN3 and IN4 pins must be connected to the Arduino. In this tutorial, pins 8 to 11 of the Arduino are used (IN1<->8, IN2 <-> 9, IN3 <-> 10, IN4 <-> 11). In the beginning, we include the header file of the Arduino plattform’s built-in stepper library. Then, we define the number of steps that the motor needs for one revolution. Stepper motors can turn out very complicated, therefore, it is not that easy to look up this number. For example, you can typically drive stepper motors in different modes and, moreover, they have a specific gear ration. Both have an influence on the number of steps per revolution. Since we drive the motor in the so-called full step mode (control sequence with four steps), each step corresponds to a rotation of 11.25 degrees according to the data sheet. This corresponds to 32 steps per revolution (360° / 11.25° = 32). In addition, the manufacturer specified a gear ratio of 64:1 for this type of motor. Normally, this gear ratio must be multiplied by the 32 steps. If you examine the 28BYJ-48 in more detail, it turns out that the actual gear ratio is approximately 63.68395:1. Therefore we set the final number of steps to 2038 (32 * 63.68395=2037.8864). Next, we initialize the stepper. The first parameter of the Stepper constructor is the number of steps. The other parameters correspond to the Arduino’s pins that we used to connect the ULN2003A driver board. In the loop function, we start to drive the motor. First, we set the speed to one revolutions per minute . Next, we tell the stepper motor to do 2038 steps. As one revolution corresponds to 2038 steps, the motor’s shaft should move a full revolution in approximately one minute. Next, we set a delay of one second. Then, we do the same thing again. But this time, we set the speed to 6 rounds per minute and move the shaft in the other direction (by setting a negative number of steps). As the the shaft moves six times faster now, the motor should finish a full revolution in about 10 seconds (60s/6=10s). The stepper motor is driven by the ULN2003A driver board. The board’s LEDs show the current control sequence state. This entry was posted in Development on September 23, 2017 by mschoeffler.